1690 (MDCXC) was a common year starting on Sunday (dominical letter A) of the Gregorian calendar and a common year starting on Wednesday (dominical letter E) of the Julian calendar, the 1690th year of the Common Era (CE) and Anno Domini (AD) designations, the 690th year of the 2nd millennium, the 90th year of the 17th century, and the 1st year of the 1690s decade. As of the start of 1690, the Gregorian calendar was 10 days ahead of the Julian calendar, which remained in localized use until 1918. June 14 – King William III of England (William of Orange) lands in Ireland to confront James II. July 10 – Anglo-Dutch navy defeated by the French in the Battle of Beachy Head (also known as the Battle of Bévéziers), giving rise to fears of a Jacobite invasion of England. 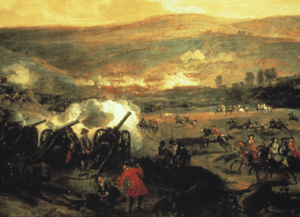 July 11 – Battle of the Boyne, north of Dublin. King William III of England (William of Orange) defeats the deposed James II who returns to exile in France. The rebellion in Ireland continues for a further year until the Orange army gains full control. July 26 – French landing party raids and burns Teignmouth in Devon, England. However, with the loss of James II's position in Ireland, any plans for a real invasion are soon shelved and Teignmouth is the last-ever French attack on England. August 24 – In India, the fort and trading settlement of Sutanuti - which later becomes Calcutta - is founded on the Hooghly River by the English East India Company following signing of an Anglo-Moghul treaty. October 6–12 October – Massachusetts Puritans led by Sir William Phips besiege the city of Quebec. The siege ends in failure. October 8 – Ottomans recapture Belgrade during Great Turkish War. December 29 – An earthquake hits Ancona in the Papal States of Italy. Possible year of the disappearance of the western part of the island of Buise in St. Peter's Flood. ↑ There is no evidence for this. Rice, Albert R. (1992). The Baroque Clarinet. Oxford: Clarendon Press. pp. 17, 40–42. ISBN 0198161883. ↑ The battle took place on June 30 according to the "old style" Julian calendar in use at this time by the English. ↑ The battle took place on July 1 according to the "old style" Julian calendar in use at this time by the English. This is equivalent to 11 July in the "new style" Gregorian calendar, although today commemorated on July 12. 1 2 Williams, Hywel (2005). Cassell's Chronology of World History. London: Weidenfeld & Nicolson. p. 285. ISBN 0-304-35730-8. ↑ "Parades and Marches - Chronology 2: Historical Dates and Events". Conflict Archive on the Internet (CAIN). Retrieved 28 January 2010.